Always running, yet no place to go. Only trash-littered streets corners, abandoned buildings and alleyways. Beaten by police and condemned by society. No voice. No worth. Nothing to grab onto and no hope for tomorrow. Mere survival. Why even think about tomorrow when you don’t know what you’ll eat next or where you’ll sleep tonight? What does it even mean to dream about the future? Abandoned and abused by the very ones who should have extended love and protection. Does love even exist? Or was it all just a lie? Wounded by the past and chained by the present. Nowhere to go. 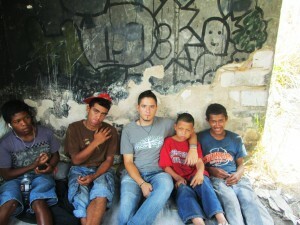 This is the grim reality which many children and teenagers on the streets of Tegucigalpa have to live every single day. Not so much because they are rebellious kids on some great adventure, nor because they ever wanted this life for themselves—but because they are rejected kids who, sadly, have found the streets and drug abuse to provide a refuge that their childhood years never knew. It is a reality that seems worlds away from mine; and yet it is the reality to which God has opened my eyes through my time as street minister at the Micah Project. It has been harder than I ever thought, and at the same time more beautiful than I could have ever imagined. The street guys—their stories, their suffering, their victories, their relapses, their tears, their courage, their brotherhood—have all engraved themselves into my heart and forever changed me. Of these, 16-year-old Edgar continues to remain at the forefront of my prayers and my heart. This is not the first time I have written about Edgar; I have long felt a specific and urgent desire for him to leave the streets and walk in the new life and purpose that I know the Father has in store for him. Honestly, you don’t know how much I wish I were sharing a story of redemption in his life with you right now… But I’m not. I wish with all my heart that I were writing of a victory over the chains and darkness in his life… But that’s not the case. As much as it pains me to share with you the continued struggles in Edgar’s life, I do so because it’s a story that needs to be told. A voice that needs to be heard. Two and a half years after I met Edgar, he continues to live on the streets, spending much of his day in the downtown area of the city. 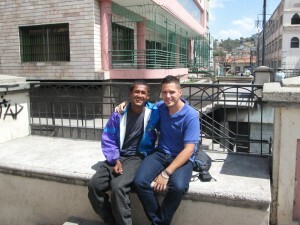 I often run into him kicking around an old soccer ball in one of the central plazas with some of the other street kids. Other times I find him sitting on one of the nearby street corners begging for money or food as people pass by. Still other times I find him asleep on an old, bug-infested mattress with some of the other street kids under an overpass, where they have hung up a deteriorated cloth as their only means of privacy and protection. Almost invariably he has a bottle of yellow glue up to his mouth—what he sees as his only source of life and hope, but in reality is slowly robbing him of both. He is usually dressed in dirty clothes and a raggedy pair of shoes that are too big for him. His hair is often overgrown and dirty, except when he has it shaved off from time to time to get rid of lice. Needless to say, Edgar is a wreck on the outside. But beyond that outer façade lies the story of a boy who has known more than his fair share of pain and suffering from a very young age. It is the story of a boy whose outer scars from beatings and abuse on his body are no match for the inner scars of rejection, fatherlessness and abandonment that have unforgivingly marked his soul. It pains me to see where Edgar is today. He is not the same Edgar that I have previously written about. He has changed, as the streets have continued to grind away at his soul, and he has fallen into deeper darkness than ever before. He no longer just inhales yellow glue, but has now also begun using crack. And he no longer just begs for money, but has now also resorted to robbing. It breaks my heart when, from time to time, I see Edgar running as fast as he can down an alleyway, knowing that he has just robbed someone. And so, yes, Edgar is a thief. Yes, he is a drug addict. 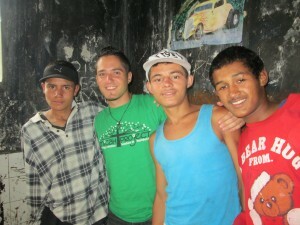 Yes, he is a dirty, seemingly hopeless kid living on the streets of Tegucigalpa. But that is not the truest reality that defines him. The truest reality is that God loves Edgar more than he could ever dare to imagine, that nothing past or present is beyond the redemptive power of God’s relentless love, and that the Father desires with all His heart for Edgar to come home to the abundant life and purpose that He always wanted for him. ust a few weeks ago I had a conversation with Edgar in which he expressed his sincere desire to leave the streets, confessing his brokenness and utter helplessness. He told me that it was so hard for him to change because the Devil had him trapped, but that he knew God wept every time he used drugs or robbed someone. After talking for a while about God’s purpose for his life, Edgar asked me to pray over him (which is the first time he had ever directly asked me that). When I finished praying, Edgar looked up at me with tears in his eyes. I could not help but think of David’s words in Psalm 51:17: “The sacrifices of God are a broken spirit; a broken and contrite heart, O God, you will not despise.” And even though Edgar did not leave the streets that day and has since continued to walk in darkness, I refuse to give up on Edgar, because my Father hasn’t. I keep praying that Edgar will come to see the “freedom” of the streets for the chains they really are, and that he will one day find true and lasting freedom in the Father’s arms—before it’s too late. Until then, I cling onto the hope that each new day is a new chance, and that my tears of sorrow for Edgar will one day become tears of joy. It is my prayer that Edgar, among others, will one day be able to echo these words, and that their testimonies will tell of the Lord who mercifully heard their cries and mightily rescued them from the pit of destruction. I believe that the old Micah house can serve as the rock upon with the Lord will set their feet and make their steps secure—a platform upon which they can find true healing from their wounds and addictions, where they can walk and grow in an intimate community of grace and redemption, where they can receive technical training and education, and where they can learn to live out the abundant life and purpose that God has for each of them. And, one day, they will in turn reach out to those who are still lost and trapped on the streets; the new song in their mouths will be a powerful testimony and bring many to put their whole trust in the Lord, one life at a time. Now may the peace of God that surpasses all understanding guide and keep your hearts in Christ Jesus.